4. How are the pitars in various forms of existence satisfied by the food offered in the ritual of the shraddha ? The brahmin invited for the place of the deceased ancestors (pitars) in the ritual is seated facing the north. He is called the pitar–brahman. The brahmin invited for the place of Deity in the ritual is seated facing the east. He is called dev-brahman. 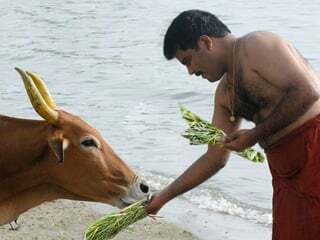 A small square is marked with water on the ground in front of the Dev-brahman from the northwest to the northeast and the banana leaf is placed on it to offer the meal to him. A circle is marked on the ground with water in front of the pitar-brahman in the same way. Thereafter the meal is served on leaves to the Family Deity, Deities worshipped traditionally in the house, cow, for pindbhojan etc. A sheath of Holy ash (bhasma) is drawn around the leaf to prevent negative energies from creating obstacles in the meal. Offering oblation in the fire (Agnoukaran). In the Rugved period, pitrupuja was performed by offering the pinda as oblation in the sacrificial fire. In agnoukaran ritual, ghee is first smeared on the leaves to purify them. The person performing shraddha sits in front of the pitar-brahman, places cooked rice on a small leaf, and puts ghee on it. This heap of rice is parted in two with the help of a darbha. Fire in the form of darbha is installed on the hand. After making two parts of the rice, the person performing shraddha picks up some rice from the center of the rice on the north side in his right hand. He smears it with ghee by his left hand and places it in the hand of the pitar-brahman. This action means, oblation to pitars in the form of Soma, that is, Deity and to fire. For this meal, food items are served on a banana leaf in a specific manner. The person performing the shraddha sits in front of the Dev-brahman by placing his folded right knee on the ground and offers the leaf to Vishvedev. Then by holding the right hand of the Dev-brahman, meal is offered to Vishvedev. A prayer is made, ‘Let this food be partaken’ and also, ‘Let the fruit of offering food close to Vishnupad at Gaya ji be acquired. In the ritual of shraddha, reference to Gaya ji appears many times. The place, Gaya ji is charged with subtle, inferior desire vibrations. Hence, shraddha performed there is more fruitful. 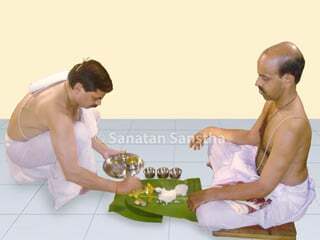 The banana leaf is offered to the pitars by placing the bent left knee on the ground in front of the pitar-brahman. 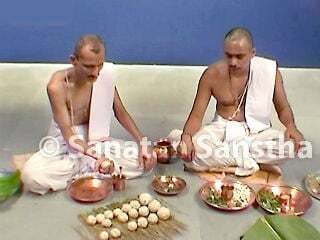 The food is offered by holding the hand of the pitar-brahman in a reverse manner. 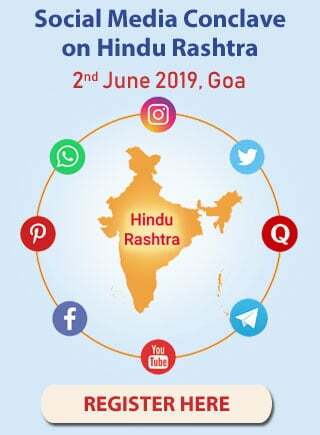 Now the person performing the shraddha says, ‘I have offered you the meal considering you in place of my pitars of this particular lineage (gotra). Please partake it. Let me acquire the fruit similar to food offered at Gaya. Now both the brahmans offer pranahuti. 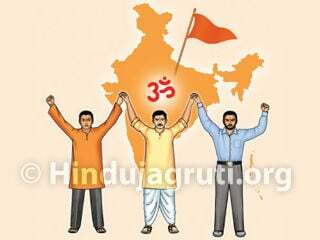 Shlokas should be recited during the meal of brahmans (brahman bhojan). The Moon channel gets activated by sitting with the right knee on the ground. Hence, the person performing the shraddha can easily receive the frequencies of Deities. The Sun channel gets activated by sitting with the left knee on the ground. Sun channel is associated with raja guna. It becomes easier to invoke the pitars with the help of this raja guna. In a way, brahman bhojan is an oblation given in the fire present in the stomachs of the pitars and Deities. satisfied by the food offered in the ritual of the shraddha ? reborn, what is the use of taking his name? To give the portion offered to the deceased ancestors in the shraddha to the particular subtle body is the responsibility of the Deities of Pitruloka. The mental sheath, that is, the baggage of previous birth accompanies a person. The action addressed to this baggage definitely reaches there. If without any reason we suddenly feel satiated on some day, we can surmise that somewhere our son from the previous birth has performed our shraddha. The Pindapujan has been mentioned in the Yajurveda, Brahman, Shrutis and the Gruhya Scriptures. According to Mahabharat, Varahadeva, the incarnation of Sri Vishnu, gave complete information about shraddha to the world. He took out three pindas from His molar tooth and kept in the south direction on a darbha. Proclaiming that ‘these three pindas should be considered as the forms of the father, grandfather and great grandfather’, He performed ritualistic worship of the pindas with sesame seeds. Tilodak is offered on a special pinda made for those deceased ancestors who had died by burning in fire or who died in the womb. The person performing the shraddha asks, ‘Are the Vishvedev appeased ?’ ‘Are the deceased ancestors appeased ?’ After saying, ‘Let all the Deities be appeased and the karma of shraddha be done as per the Scriptures’, the person performing the shraddha pays obeisance. The priests say, ‘’Let the desire of the person performing the shraddha be fulfilled by the grace of Deities and the deceased ancestors’’. Thereafter, the other members of the family pay obeisance to the pindas. Subtle experience of the subtle at the time of the pindapujan in a ritual of shraddha: Some pindas are placed at the center of the darbha. Four Dharmapindas are placed in the four corners. Red rays are emitting from the dharmapindas, a symbol of dharmashakti. Yellow spirals of Chaitanya are seen around the pindas of pitars. Meaning: If a person performs shraddha using mere grass but with faith and devotion, then nobody in his family becomes unhappy.